2011 All-Star team logos / Icethetics renderingThe best players in the NHL will get together at the end of the month for what's arguably the most fun event of the hockey season. And Icethetics has a preview of what they'll be wearing. Since the league changed the format of the 2011 NHL All-Star Game, there's no East vs. West. And no North America vs. the World. Instead, two captains will hand pick their teams in the coolest fantasy draft ever. I recently got a sneak peek at the new uniforms and logos to come — though the official unveiling date must be imminent. Each team will wear a colorized version of the NHL shield with two stars placed inside. Team Blue will don dark blue jerseys while Team Red sports white. On both uniforms, it looks like the jersey number will be placed on the front, centered just above the colorized NHL shield. The numbers on the back have a unique look, filled with unevenly spaced thin lines that angle upward. Hard to describe but you'll understand when you see it. The numbers and surname letters are set in italicized text, not your typical block font. It also looks like both jerseys have the 2011 All-Star Game logo sewn on the front, right shoulder. At this time, I have no information about the striping or any other elements of the jerseys. We'll have to wait until the NHL is ready to show it to us. Have to ask, though: What's taking so long? In the meantime, just know that the above logos are renderings I've made based on what I've seen and been told up to now. Things can change, but as of now I do believe them to be accurate. Jason and Joe, yes, you read that right. The player's number will be situated on the front just above the crest. It's small and inconspicuous, but it's there. Glen, traditionally the player's team logo is sometimes placed on the shoulder. I'd imagine that will be the case here, however I don't think it would be on the front like the All-Star patch since that's where the captains' C or A goes. Stephen, interesting note about the naming of the teams. I don't know where you heard it but I could see the teams being named after the captain (i.e. : Team Crosby, Team Toews). Spyboy, good point about waiting until the weekend of to choose the teams. It could indeed hurt sales of customized jerseys as fans won't know in advance who will play on which team. We don't even know the captains yet. But I do agree with you that we need to let it all play out before deciding whether it's good or bad. As always, thanks for all the great comments. Jake asked if the italicized numbers are a carbon copy of what the host team, the Hurricanes, wear. No. Other than the fact that the characters lean, the numbers and letters bear no resemblance at all to what's on Carolina's uniforms. They're more rounded and narrower. JD says he's heard that all players will be allowed to wear their regular numbers regardless of whether there are other players with the same digits. I have not heard that so I can't speak to its validity but it's an interesting notion. Personally, I'm not a fan of the idea. Go down and read the comment by hstebbs at 9:50 PM for some thoughts on how the teams might be picked differently depending upon who's named captain. Colton, I have not yet seen the complete uniforms. I only got a little peek at the two jerseys and I've described all the elements I've seen as best I can. It's a bit outside the box, but definitely in a good way. Keep the questions and thoughtful observations coming. Icethetics renderingSeveral have asked in comments or by email for a better idea of what the numbers will look like. This image to the right is the best that I can do. However, there are some differences. The lines I have in this rendering are straight. On the jersey, they're slightly curved, more of an arc than a straight line. The font isn't quite right either. For one thing, the A's should be rounded at the top. But you get the basic idea. It's the same thing for the red team — only in white with red numbers and names, of course. It's not a bad look and I think it'll blend in more if you're watching from the stands or on TV. Seems more of a close-up detail. Apparently UniWatch was all over the subject of All-Star uniforms just as I was starting my cross-country move in November, so I missed it. A reader wrote in with details from the Hurricanes' pro shop. It mostly jibes with what I've seen, but there's more. 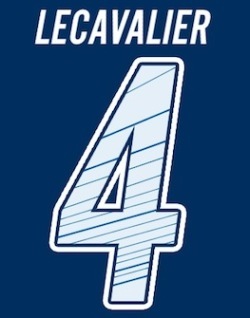 Sweaters will have the player's number on the sleeves as well as the back and front (above the crest). The uniforms used in 2002 and 2003, which also used the NHL shield, did not have sleeve numbers. And it seems this is where the rumor started that has players wearing their own number despite duplicates on the same team. The example cited was Staal and Iginla possibly being on the same team and both sporting No. 12. I'm not a fan of that, personally, as I like seeing what number players would choose if they ever ended up on the same team. I also like how Joe Thornton always wears No. 97. Just different. The Fantasy Draft will be held on Friday, Jan. 28 and televised for all to see. Mark commented that he'd watch only to see who's picked last (which will be a funny moment, I'm sure) but that the game would be irrelevant. I'm guessing he means inconsequential as it's quite relevant to the fantasy draft. But yes, Mark, it's the All-Star Game. The only relevance is that it's fun to watch the best guys all on one sheet of ice. The first six All-Stars were chosen by "fans" to be Crosby, Malkin, Letang, Fleury, Toews and Keith. The other 36 will be named by the league. Then all 42 players will vote to determine the captains. The NHL confirms the two teams will then be named after the captains. A coin toss decides who gets the first pick. Not sure how they're determining which color each captain gets, but maybe the coin toss decides that too. There are some details about how the draft will work and which positions have to be picked by which round, but you can read more about that on your own. And that should wrap things up on the subject of the 2011 All-Star Game — at least until the uniforms are officially unveiled.